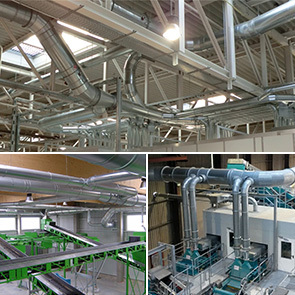 R&R Beth build, manufacture and mount pipe systems in different steel and stainless steel qualities for the most differing demands of their customers. They are also able to implement especially static demands to free-hanging pipeline systems, e.g. 35 m unsupported without additional supporting structures. They adapt the material qualities and the wall thicknesses of the piping components to the media to be transported (abrasion and chemical composition). R&R Beth manufacture high quality, coordinated and precise longitudinally-welded pipes. You get complete systems or single units for various applications. Their production line includes an extensive and modern machinery pool, including a variety of metalworking machines, longitudinal welding machines and plasma cutting machines. R&R Beth manufacture longitudinally-welded pipes for the transport of the extracted dust. If the media is under high pressure or has strong abrasive properties, R&R Beth produce pipe systems in so-called “heavy construction” with 8 mm wall thickness. The welding is done according to DIN 24154 to provide the quality of their products and to guarantee a smooth process flow.